List of igt casinos with honest review including reputability check of every igt online casino listed. IGT’s origins can be traced back to the 1950s, but they made their global splash when they went public in 1981. They were the original creator of the first video poker machine. In 1981, International Game Technology, or IGT, was the world’s largest slot machine manufacturer and land-based casino provider. IGT bought WagerWorks in 2005 and gave them access to all of their content and property portfolios. WagerWorks operates under the same banner to provide IGT with new technology and compliance to online gaming standards. With over 30 years of experience in developing high quality products, IGT is now widely regarded as one of the forefathers and pioneers of online gambling. 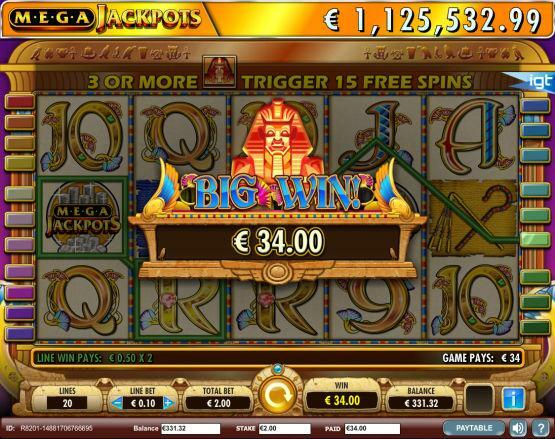 IGT also created the very first progressive slot system called Nevada Megabucks, which had a jackpot of $1 million. As a result, in 1989, they were awarded the US Senate Productivity Award and in 1990, released the Red, White & Blue as well as Double Diamond slots, which were the first themed slot machines of their kind. In 1991, IGT was listed on the New York Stock Exchange. IGT Europe started operating a year later and in 1993, IGT produced its first product for the Japanese machine market. In 2003 they were named in BusinessWeek magazine’s list of 50 Top-Performing Companies, as well as Fortune’s 100 Fastest-Growing Companies list. In 2005, they took over WagerWorks. This is still only a brief summary of all their achievements, and IGT has been responsible for countless many more innovations . Some of the IGT casinos above are powered by a variety of different software providers, so that players can enjoy all their favorite games in one place. The IGT Interactive software is generally considered as reliable and trustworthy, and is licensed in Alderney. IGT Interactive software boasts attractive sharp graphics and quality sound effects. With its roots in land based slot machines, it is only natural that IGT Interactive would concentrate on slots, and it offers a fine selection of exciting slot pursuits. The downside is that the games are not available in some countries, including the USA due to online gaming laws. IGT casinos offer over 100 online games, with accompanying information on payout percentages for each game, for added transparency and fair play. IGT has almost certainly undergone more testing than any other casino games developer in the entire world. As top experts in the industry, they understand the importance of fairness testing. IGT online casinos check the fairness of their games through third-party audits. One of the companies that performs this testing is TST, a leading firm of mathematicians. Most IGT casinos will have additional testing done and post the results on their websites, for added peace of mind. IGT casinos run all their games directly through Adobe Flash in their players' browsers. This means that a player can register at the casino website and play any of the games without having to download any casino software. This format works out wonderfully. Casinos can, if they choose, add additional software platforms, or combine the IGT games with other sections like live gaming, poker, or bingo. This kind of diversity is incredibly unique, and one of the primary reasons IGT casinos are so successful. IGT Interactive offers customers an attractive online progressive jackpot network that is reset at a huge amount, following each win. This network holds a ₤1.5 million minimum payout that is recognized as the largest in the industry. Casinos featuring games from International Game Technology (IGT) may contribute to the one progressive jackpot known as MegaJackpots. There are several different games that contribute to this pool, including MegaJackpots Monopoly, MegaJackpots Cluedo and MegaJackpots Cleopatra. The biggest IGT progressive jackpot was won on 30th September 2013, in the amount of an impressive £2,148,947. IGT bonuses vary greatly among casinos. Because IGT games are designed for Flash-based instant play, the individual casinos are free to set up a promotional structure that best fits their players. Because of this, the sites in our list of IGT casinos may offer no deposit bonuses, match bonuses, contests, and free spins in a variety of different ways. The slots come in a variety of popular formats, including 3-reel classic slots and 5-reel video slots, with both progressive or non-progressive jackpots. Each game comes with a unique pay-line configuration, relevant symbols (standard, wilds, scatters and bonuses), as well as free game paths and bonus games to keep the action flowing . Some of the company's most popular games include Dungeons and Dragons: Fortress of Fortunes, Wheel of Fortune, Da Vinci Diamonds, amongst many others. Online IGT casinos are typically some of the biggest in the world. Their success is partly derived from the way IGT actually helps them best serve their players. Instead of just handing them a piece of software, IGT will work with their casinos to ensure that they are able to provide players with the best experience possible, from better game design to promotional ideas. You can find games from IGT at some of the world’s most popular casinos, such as at Mr. Green or Leo Vegas Casino. Don’t forget to check our casino reviews before playing. IGT, which has recently completed one of the biggest mergers in the industry’s history with GTECH (2015), produces some of the most popular video slots on the market. Thanks to their innovations and good merging strategies, IGT will most likely continue to be successful in the years to come. Alderney 31 Isle of Man 0 Malta 83 Gibraltar 143 Jersey 0 Kahnawake 0 Panama 0 Curaçao 31 Unknown 0 Belize 0 Costa Rica 1 United Kingdom 245 Austria 0 Canada 0 Antigua and Barbuda 0 Belgium 3 Bosnia and Herzegovina 0 British Virgin Islands 1 Bulgaria 1 Cambodia 0 Comoros 0 Cyprus 0 Czech Republic 0 Denmark 9 Estonia 0 Georgia 0 Ghana 0 Greece 0 Hungary 0 Ireland 0 Italy 5 Kenya 0 Latvia 0 Lithuania 0 Mexico 0 Netherlands Antiles 0 Nigeria 0 Paraguay 0 Peru 0 Philippines 0 Portugal 0 Romania 2 Serbia 0 Slovakia 0 Spain 3 Sweden 45 Aland Islands 0 Schleswig Holstein 2 British Columbia 1 Cagayan Economic Zone 0 Delaware 2 Nevada 2 New Jersey 8 Ontario 1 How we rate Licensing Jurisdictions?